Summary: Researchers report on how differences in cortical anatomy relates to each of the five factors of personality. Our personality may be shaped by how our brain works, but in fact the shape of our brain can itself provide surprising clues about how we behave – and our risk of developing mental health disorders – suggests a study published today. According to psychologists, the extraordinary variety of human personality can be broken down into the so-called ‘Big Five’ personality traits, namely neuroticism (how moody a person is), extraversion (how enthusiastic a person is), openness (how open-minded a person is), agreeableness (a measure of altruism), and conscientiousness (a measure of self-control). In a study published today in the journal Social Cognitive and Affective Neuroscience, an international team of researchers from the UK, US, and Italy have analysed a brain imaging dataset from over 500 individuals that has been made publicly available by the Human Connectome Project, a major US initiative funded by the National Institutes of Health. In particular, the researchers looked at differences in the brain cortical anatomy (the structure of the outer layer of the brain) as indexed by three measures – the thickness, area, and amount of folding in the cortex – and how these measures related to the Big Five personality traits. In addition, as we get older, neuroticism goes down – we become better at handling emotions. At the same time, conscientiousness and agreeableness go up – we become progressively more responsible and less antagonistic. The researchers looked at differences in the brain cortical anatomy (the structure of the outer layer of the brain) as indexed by three measures – the thickness, area, and amount of folding in the cortex – and how these measures related to the Big Five personality traits. NeuroscienceNews.com image is adapted from the University of Cambridge press release. “Our work supports the notion that personality is, to some degree, associated with brain maturation, a developmental process that is strongly influenced by genetic factors,” says Dr Roberta Riccelli from Italy. The researchers found that high levels of neuroticism, which may predispose people to develop neuropsychiatric disorders, were associated with increased thickness as well as reduced area and folding in some regions of the cortex such as the prefrontal-temporal cortices at the front of the brain. Credit: The researchers/University of Cambridge. Image Source: NeuroscienceNews.com images are adapted from the University of Cambridge press release. University of Cambridge “Naughty or Nice? Personality Traits Linked to Differences in Brain Structure.” NeuroscienceNews. NeuroscienceNews, 25 January 2017. University of Cambridge “Naughty or Nice? Personality Traits Linked to Differences in Brain Structure.” http://neurosciencenews.com/personality-brain-structure-6005/ (accessed January 25, 2017). The five-factor model (FFM) is a widely used taxonomy of human personality; yet its neuro anatomical basis remains unclear. This is partly because past associations between gray-matter volume and FFM were driven by different surface-based morphometry (SBM) indices (i.e. cortical thickness, surface area, cortical folding or any combination of them). To overcome this limitation, we used Free-Surfer to study how variability in SBM measures was related to the FFM in n = 507 participants from the Human Connectome Project. Neuroticism was associated with thicker cortex and smaller area and folding in prefrontal–temporal regions. Extraversion was linked to thicker pre-cuneus and smaller superior temporal cortex area. Openness was linked to thinner cortex and greater area and folding in prefrontal–parietal regions. Agreeableness was correlated to thinner prefrontal cortex and smaller fusiform gyrus area. Conscientiousness was associated with thicker cortex and smaller area and folding in prefrontal regions. These findings demonstrate that anatomical variability in prefrontal cortices is linked to individual differences in the socio-cognitive dispositions described by the FFM. 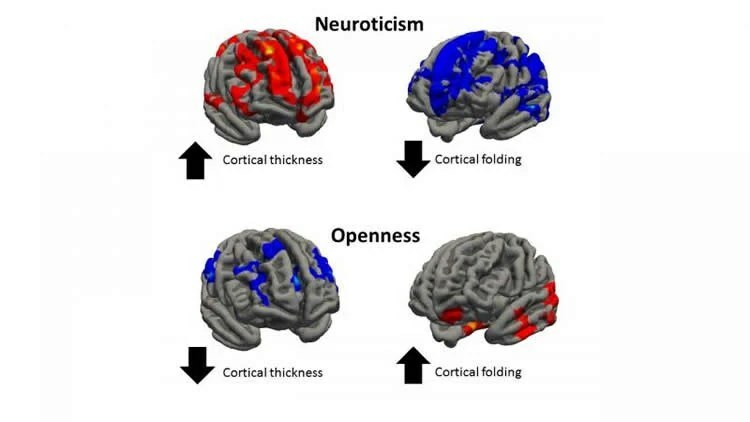 Cortical thickness and surface area/folding were inversely related each others as a function of different FFM traits (neuroticism, extraversion and consciousness vs openness), which may reflect brain maturational effects that predispose or protect against psychiatric disorders.